SMOK has long been at its best in making vape pens. The SMOK X8 is a typical pen style device made by SMOK. There is no exception with the SMOK X8. This kit comes to us through a more convenient footprint than a typical box mod. And many of its attributes resemble its descendant, SMOK Stick V8. Upon the closer experience, the main improvements added to the X8 are designed to make this vape pen more attractive and appealing to a wide range of vapers. Bundled with a 3000 mAh internal battery and charged with the Micro USB provided in the package, it is sufficient for most users to have a whole day use. Among the various highlights, the single button design is rather useful which functions as a power button as well as an intelligent battery life indicator. The design also simplifies the look. Besides, the rugged and durable device incorporates a holistic set of safety features to help itself avoid short circuit and low battery voltage. Speaking of the tank, the SMOK TFV8 X - Baby Beast Brother matches well with the Stick X8 device which shares similar key features with its lineage brother, the TFV8 Big Baby Beast. The liquid volume of this tank is 4 ml. It is big enough for most of you ， isn’t it? A commonly recognized top fill system is applied to the X8 as well. 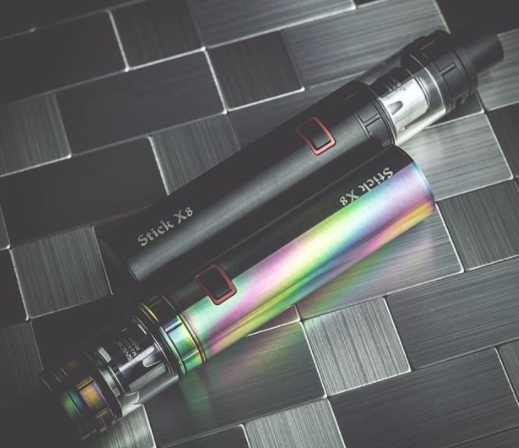 If you are looking for a suitable and satisfying pen style vape, do never leave Stick X8 behind. This device is able to deliver you the top notch property. The package includes the X8 device and the TFV8 X - Baby Beast Brother tank, the X - Baby * 4 0.13 ohm quad coil head and an x- Baby M2 0.25 ohm coil head, plus a Micro USB cable. Apart from these, there are also some standby components for DIY.